The only thing better than a Hellcat is a Demon. The only thing better than a Demon is a Hellcat engine with 1,100 horsepower. The only thing better than that is when the engine is stuffed into an AMC Javelin AMX. And the only thing better than that? When it’s all wrapped up in JALOP GOLD. 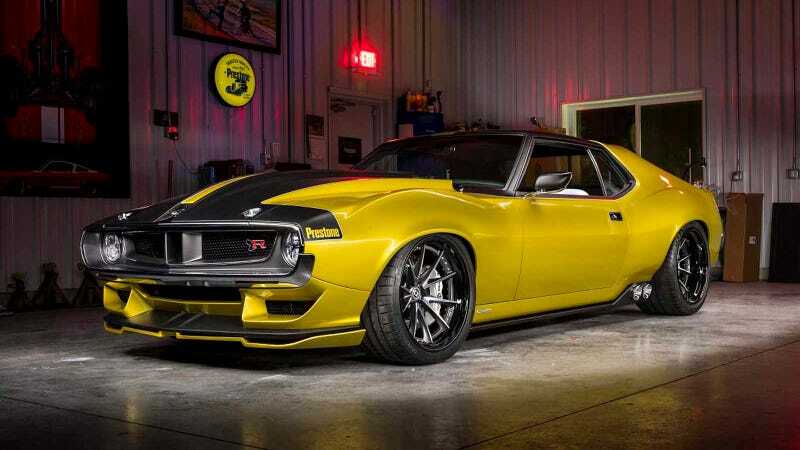 This 1972 AMC Javelin AMX, created by the Ringbrothers in conjunction with Prestone, was clearly created in an ultimate pursuit of perfection. Mostly because of the JALOP GOLD. Yes, seriously, JALOP GOLD. The finest, most premium, most luxurious and worthy paint ever created. JALOP GOLD, for the discerning automotive enthusiast, who values nothing more than the best of Highlights: For Children. Are we being pandered to? If the paint isn’t doing it for you – and frankly, if it isn’t, that’s your problem and it’s between you and your God – the rest of the car should do the trick. The 6.2-liter, 707-horsepower V8 out of the Dodge Challenger Hellcat has been dumped into the engine bay, but Jim and Mike, AKA the Brothers Ring, have swapped out the stock supercharger for a 4.5-liter Whipple unit. And despite the source car being a traditional muscle car, the Wisconsin-based Ring Brothers didn’t stop at the engine. Much of the body is carbon fiber. The suspension is a custom setup. Those sweet, sweet side exhausts are new. And those spiffy Baer brakes should be enough to haul your shiny golden missile down from simply unconscionable speeds.